Click on a chapter title to access that chapter to read on-line from this site. You can download the book for free, as a PDF document to be read with the Adobe Reader. My version of the novella is a copy I've edited (removing scanning and editing errors only), from Project Gutenberg. You can download the book from them in various formats, also for free. An image of a younger Elizabeth. You can view the film "Enchanted April" via YouTube. Here is the first part. I suggest if you like what you see, you should purchase the DVD for the beautiful, full-sized images of the luscious gardens, views and castle. The 1992 film was filled on location in Portofino, Italy, at Castello Brown, the castle where Elizabeth von Arnim stayed in 1920, and where she is said to have written the novella The Enchanted April. 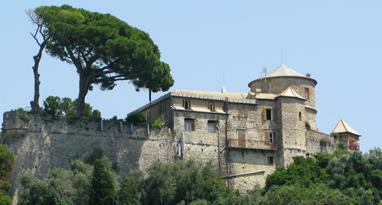 It is a museum today, owned by the city of Portofino, and open to the public. I have Elizabeth's Garden and Solitary Summer on my site. 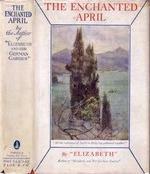 The novella, and basis of the 1992 film of the same name, was The Enchanted April by Elizabeth von Arnim. It is an italophile favorite, just like the film and novella A Room with a View is, for similar reasons: the idyllic, soul-reparative Italian setting. Elizabeth von Arnim was born in 1866 and died in 1941. She was Australian by birth, English by upbringing, German and English by marriages, Swiss and French by choice, and in the end, American by emigration. She was the cousin of New Zealander-English short-story writer Katherine Mansfield, who lived as an adopted sister with her family for many years. While living in Germany in 1904, Elizabeth hired E. M. Forster to tutor her children. Interestingly, E. M. Forster authored the novella A Room with a View (1908). And one event from Elizabeth's life seems to appear in disguise in Forster's novella: Elizabeth met her husband while in Italy, touring with her father, when her husband first took notice of Elizabeth as she was playing an organ piece by Bach in a church in Rome. Elizabeth was an inspiration for Forster, and he admitted that he based at least one of his books' characters on her. 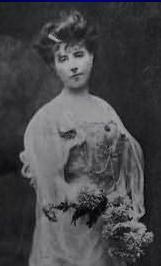 Elizabeth published 21 books during her lifetime, and wrote at least one play, that was produced to great success, based on her novel Princess Priscilla's Fortnight. 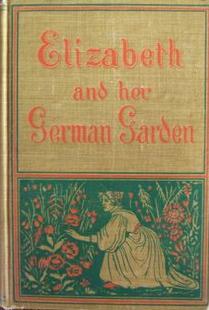 Elizabeth and her German Garden published in 1898, was Elizabeth's most popular book, and it is, like all her books, still highly entertaining to today's readers. It is ostensibly the diary of a woman who is creating a garden, but it is really a novel about her unusual views on life, on German and English society, and her on friends. The book was so popular, reprinted 20 times in the first year of publication alone, that her later books were published with the author identified only as "By the author of Elizabeth and her German Garden". Only one book, an epistolary novel purportedly by a young English girl living in pre-WWI Germany to her mother, was published with a pseudonym, Alice Cholmondeley. Presumably this was because the subject matter was more politically condemning of German society than in her other novels. Thanks to Project Gutenberg, you can read Elizabeth and her German Garden on-line, or download the book for free in various formats. The companion book, published a year later, in 1899, was The Solitary Summer. I have both these books on my site. They are lovely reads and an inspiration for gardeners. The magical spell the garden casts over the characters in The Enchanted April is mirrored in the spell the German garden casts over Elizabeth. Elizabeth was a writer with a light touch, similar in tone to E. M. Forster's lighter novels. I have most of her novels. The style could easily be called "Jane Austen light". If you enjoy Jane Austen's books, you will almost certainly enjoy Elizabeth's books. There is the Aspergers man who looks on his wife as an object rather than a human being (The Pastor's Wife). And the sadistic bully who crushes the life out of his woman (Vera). The philanderer husband (In the Mountains, The Enchanted April). The kind-hearted partner (The Benefactress, Princess Priscilla's Fortnight). The authoritarian (Elizabeth and her German Garden, The Solitary Summer). The wavering man who doesn't know his own mind or heart (Fräulein Schmidt and Mr Anstruther). The nurturing man who is romantically-sexually stunted (Christopher and Columbus). The central female characters of many of her novels are witty women with unusual outlooks on life. Elizabeth was just such a woman. A woman whose nephew called "my eccentric aunt". A woman who entertained her friends by reading sections from her diary aloud. A woman who could dazzle with her wit and charm. There are also plenty of naive, natural, odd-ball women, that one wants to shake out of their cloud world. After her husband, the Count von Arnim, passed away, Elizabeth built a home in Switzerland, in the mountains near Valois, for herself and her children. She had lost her English citizenship when she married the Count. At the outbreak of WWI, she fled with her children to England, minus one daughter who was married to a German man and living in Germany. Her second husband, a prominent English nobleman, probably helped her regain English citizenship for herself and her children. But that marriage was doomed from the start because the couple's characters were so unsuited to each other. 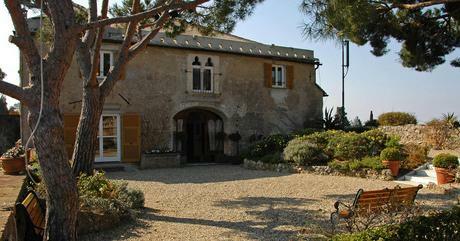 After WWI, Elizabeth spent time in the U.S. (her second daughter married an American), London (her other children eventually settled in England), and the south of France, at her villa "Le Mas des Roses" at Mougins, outside Cannes. 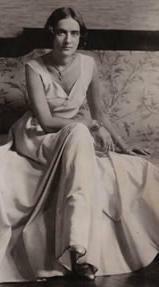 It was WWII that finally sent Elizabeth to live in the States, and that is where she passed away in 1941. The film adaptation of the novella The Enchanted April was made for British TV in 1991, directed by Mike Newell, and was released in theaters in 1992. It was nominated for several awards and won many of them. It was then adapted to stage. The Enchanted April is the story of a woman, worn down by her demanding, cold husband and by her daily routine, who escapes to a rented castle in Italy with an equally worn down girlfriend. They share the castle and gardens with two other women, both, also, suffering from a lack of love. By the end of their fairytale-like month's vacation, all are engulfed in love of one sort or another. This was not the first time The Enchanted April was adapted to another form. It was made into a play that was then the basis of a film in 1935, starring Ann Harding and Frank Morgan as Mr. and Mrs. Arbuthnot. 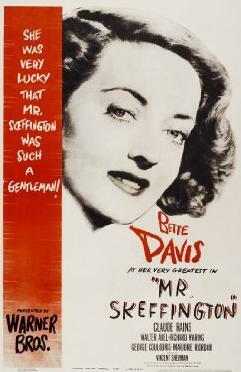 Elizabeth's novel Mr. Skeffington, published in 1940, was also adapted to film, in 1944, and starred Bette Davis. The main character is a vain woman who seems only to love herself and her brother. It is only when she loses her looks late in life, that she finds happiness in caring for her blind brother. His blindness, and his memories of her beauty, allow her live as the beauty she once was, if only in her brother's blind eyes. If something about that rings a bell, you have probably seen the 1992 film "Enchanted April". 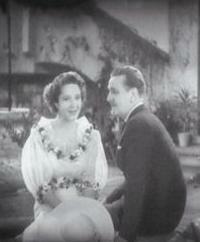 The film departs from the novella by incorporating the Mr. Skeffington trope of a beautiful woman finding true love only when the man is not blinded by her beauty because he is truly blind or nearly blind. The version of the novella The Enchanted April that I use here on my site, is from Project Gutenberg, the free online book source for out-of-print texts. I've edited out scanning and editing errors only, to create the version I use for you to read on-line. The hyperlinked Table of Contents is above in the left column, or you can go directly to the First Chapter, or you can open it as a PDF book you can get here from my site. 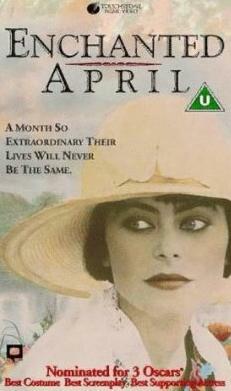 Unlike the film A Room with a View, adapted from a novella by E. M. Forster, the latest filming of The Enchanted April did not follow the novella practically word for word, scene for scene. 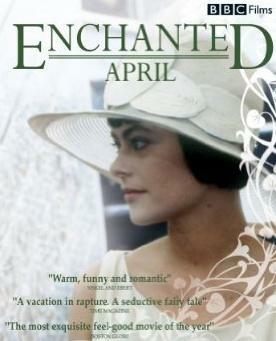 Reading the novella The Enchanted April is much more enjoyable than the film. the fable about love blooming amid the blooming, Italian, April garden is more hypnotic. I highly recommend the book. If you wish to see the film again, after reading the novella, you can see it on YouTube in several parts. I link to the first part in the left column. I collected together some fun quotes from the novella as I read it, and report them here below. Mrs. Wilkins put her arm round Mrs. Arbuthnot's neck and kissed her. "The first thing to happen in this house," she said softly, solemnly, "shall be a kiss." "Dear Lotty," said Mrs. Arbuthnot. "Dear Rose," said Mrs. Wilkins, her eyes brimming with gladness. Visit my Italian Garden page.